It’s really hard to feel down when you’re surrounded by pink. Such was my thought when I set out to decorate for the holidays this year. My favorite tree thus far was the white tree I did last year, with pale pink ornaments. But I’ve since re-decorated the living room and pulled out most of the color. 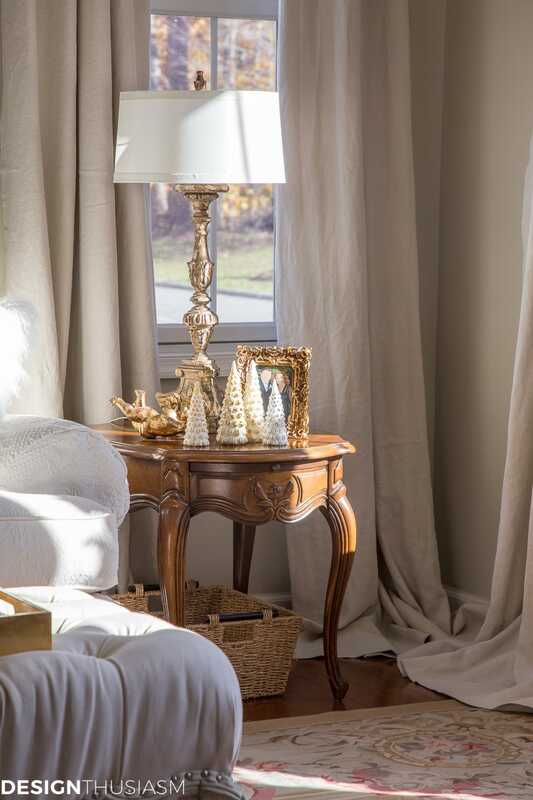 In a room that’s primarily cream and greige, the white tree wouldn’t have quite the same impact. But I still wanted that soft rosy feel. That’s when I got bitten by the pink tree bug. After a tough year, I was wanting something pretty. The living room still has some pale pink accents. Soft and offbeat. Not in-your-face Barbie pink, but gentle and blushing. I had to be careful what kind of pink I got. Let be clear from the start. A pink tree is not even trying to look natural. But I still wanted it to be elegant. Romantic. French inspired. 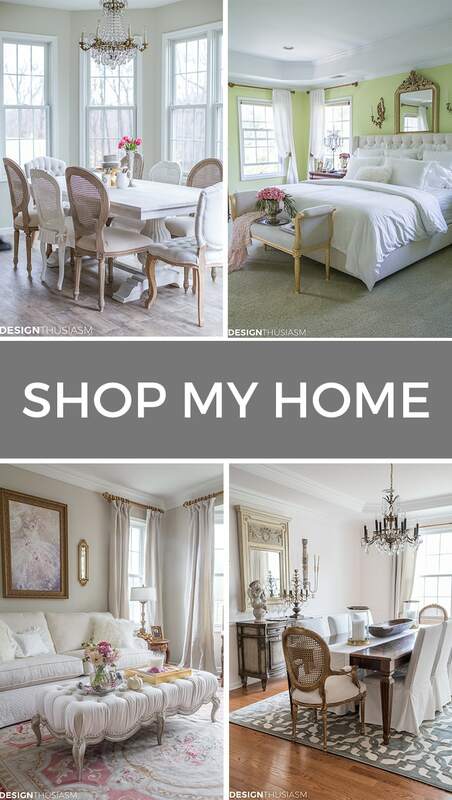 I shopped online and did my best to gauge the color from what I saw on the screen. Then I held my breath until the package came. I just didn’t want it to look like middle-school pink. But when it came it was fine, especially in the blazing sunlight that was streaming through the window that day. It had just enough color, and I knew that what I added to it would define it even further. I used rose gold ornaments to emphasize the warm undertones, bits if silver and gold for a note of bling, and soft white to temper the color. I stepped back and was pretty happy with it, but it needed something else. That’s when I noticed the vase of white roses in the kitchen. Yep, that’s what would make it mine. Once I added the roses, could pearls be far behind? The rest of the room would be decorated with a very light touch. 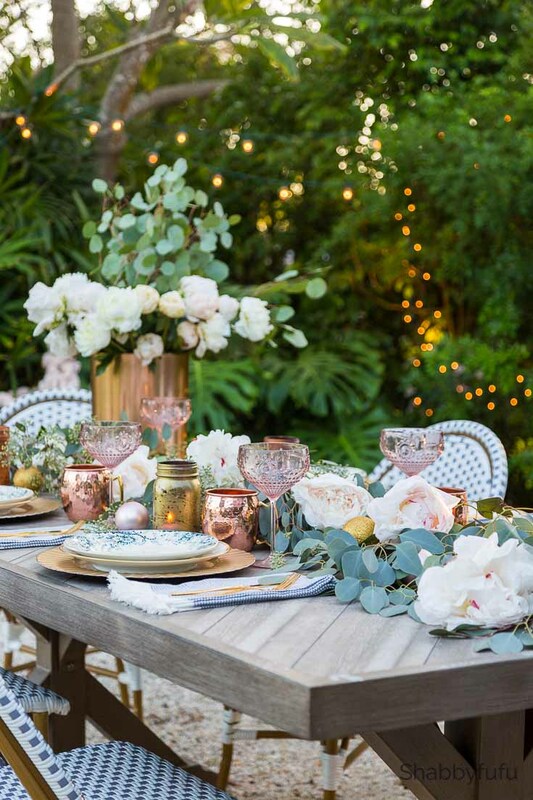 A platter of gleaming baubles in varying sizes. 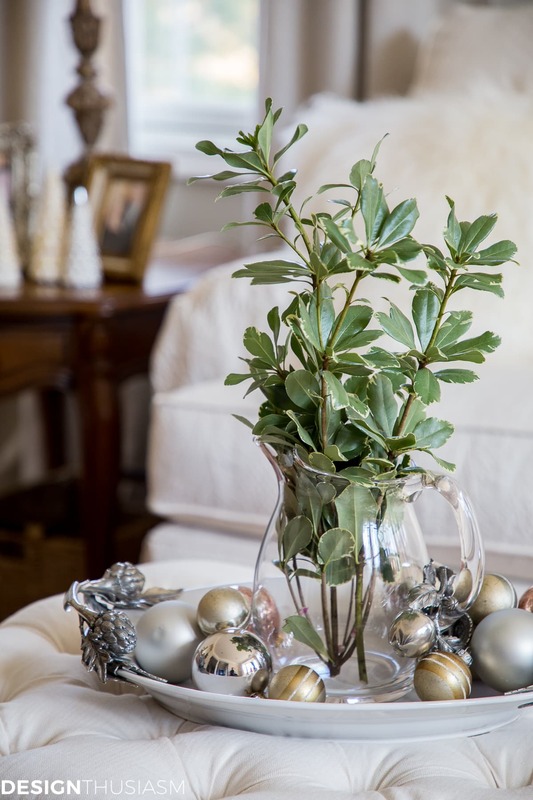 A pitcher with holiday greenery. On the side tables I placed a small collection of Snowy Glass Trees. I moved the darker chairs (which are waiting to be recovered) into another room and replaced them with these gilded cane back fauteuil chairs. 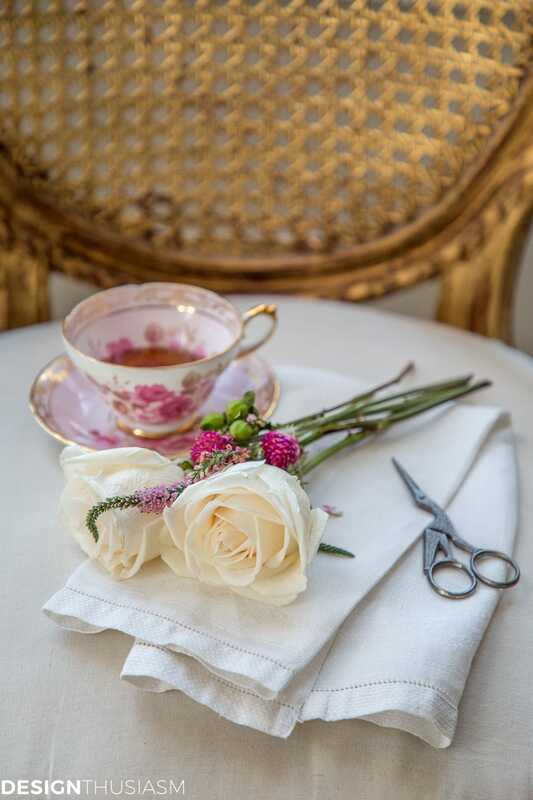 The ruffled pink throw is right at home in this venue. 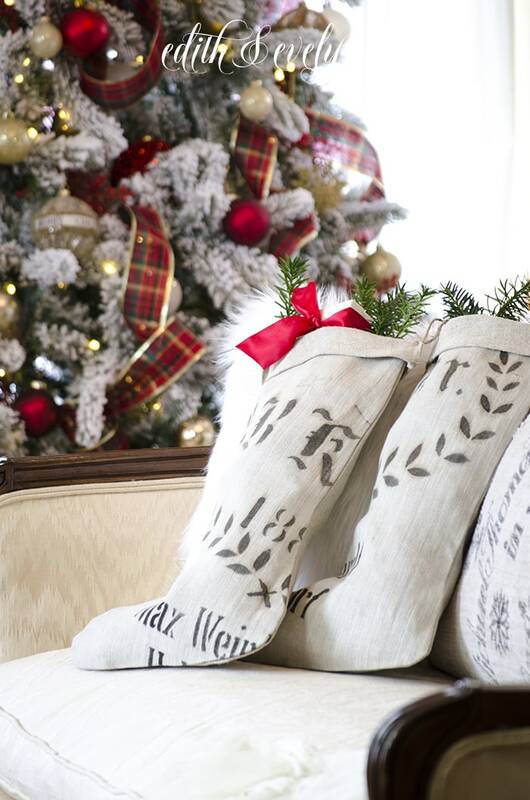 Gold trimmed gift boxes sit comfortably underneath the petite table, while a faux fur throw is used as a tree skirt. 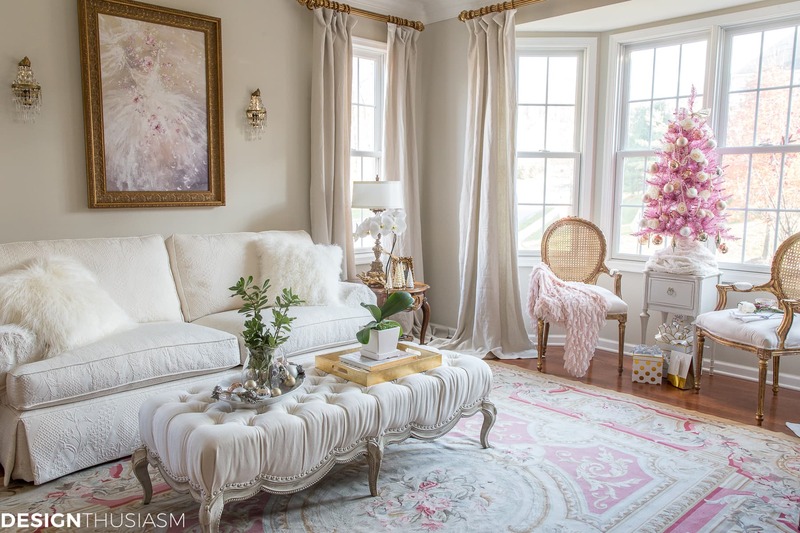 The pretty aubusson rug and feminine dress painting anchor the pinks in the room, yet the overall look is winter white. 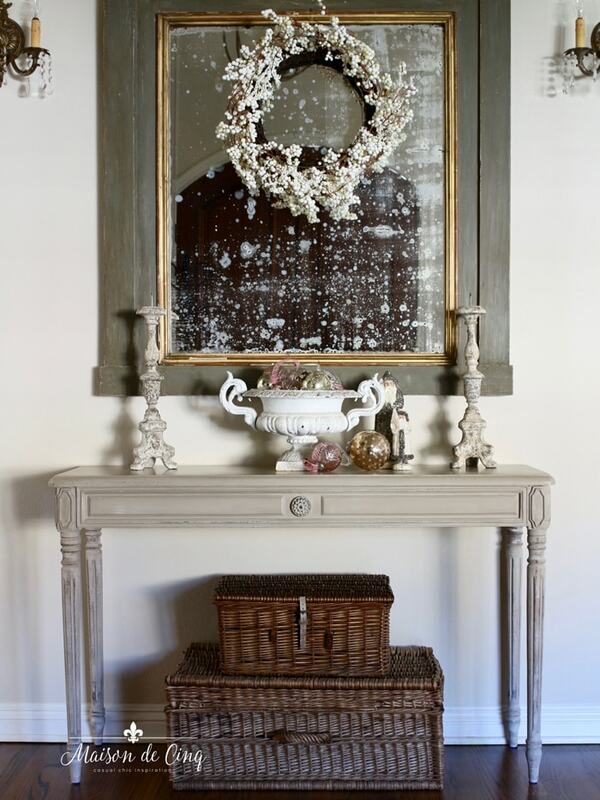 Gilded accessories and a lovely orchid round out the picture. 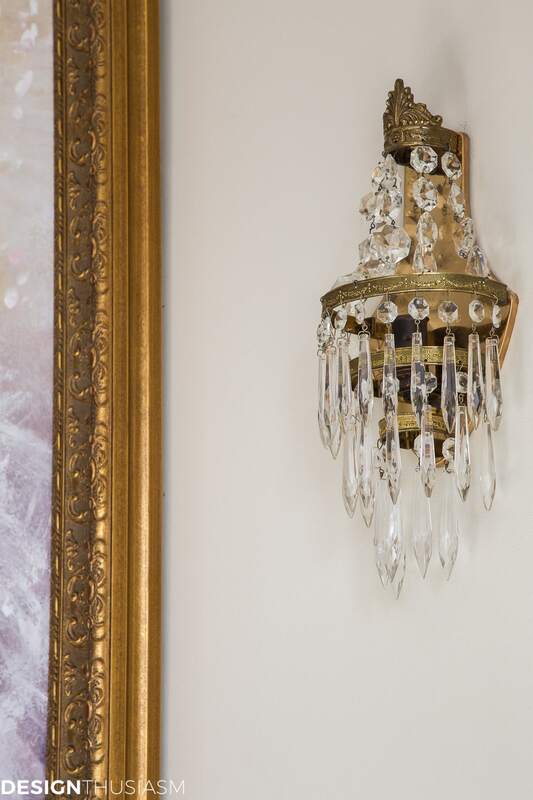 New to this room, since the most recent reveal, is a gorgeous pair of vintage sconces in a French Empire basket style with crystal drops. 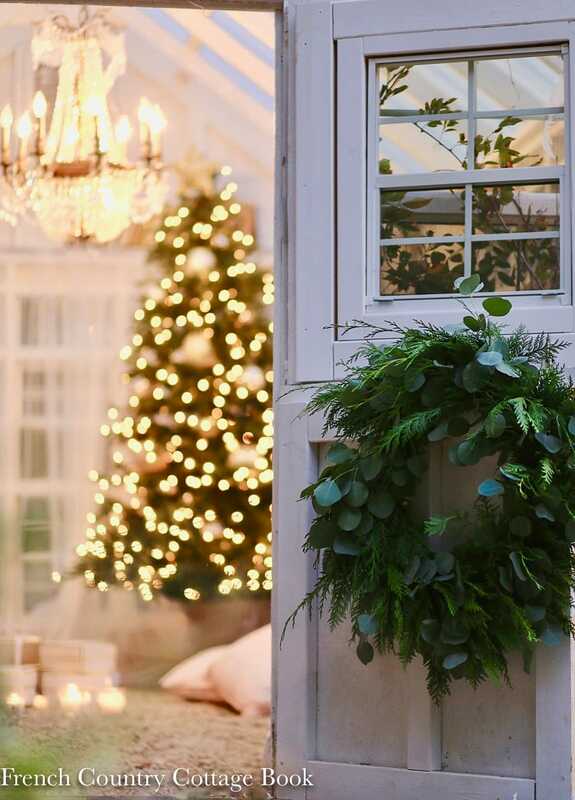 The easiest rooms to decorate with seasonal accents are those that are styled simply in your defining taste to begin with. 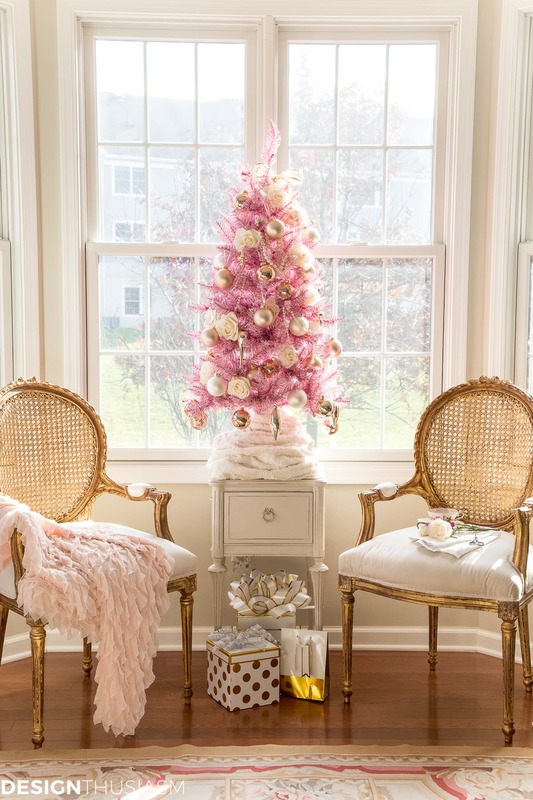 Then all it takes is the addition of a few perfectly placed adornments and if you need a little lift, you can’t go wrong with a little pink Christmas tree! 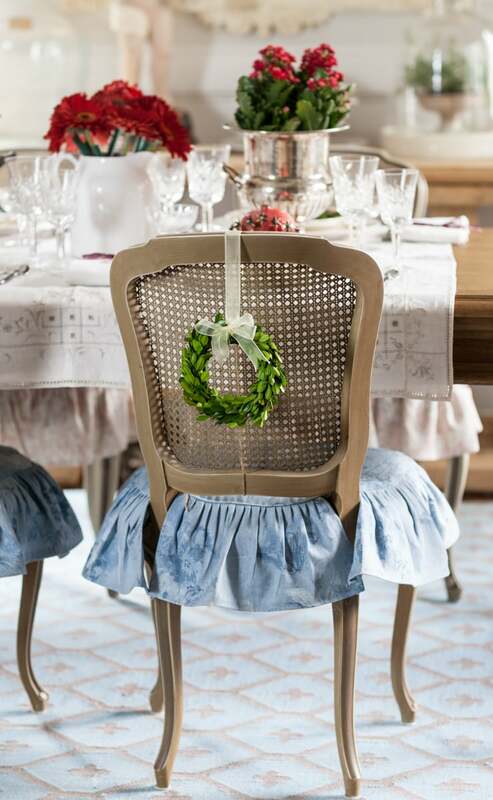 Today I’m joining with my French Country Friday friends to bring you a little holiday blog hop celebrating French Country Christmas style. You will find all the other posts below and I know you will be charmed by each! Pink Christmas tree resource list – To get the look, click on the items below for direct links to the products. Where actual items were no longer available, I’ve provided similar options. Be sure to visit all my friends’ posts below! Beautiful room, Lory and I love how the pink tree goes so well in your liviing room. It really draws the color out of the rug. Love those sconces, too. This is such a beautiful room and the pink tree could, if she chose, stay up through Valentine’s Day. She is quite lovely and looks right at home in your living room. 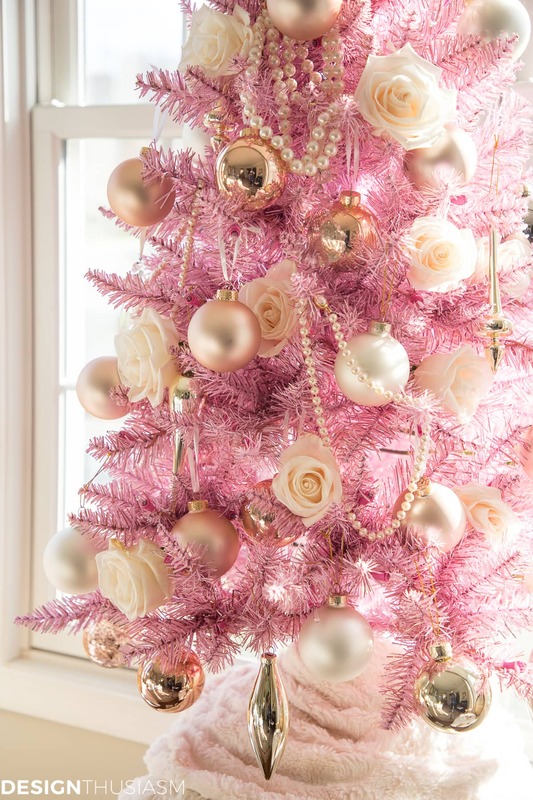 Christmas beauty in pink…love it! Your pink tree is so cute and definitely very “you”!! Love it!